Well, we’ve had little Woody for three days now. The first day he wouldn’t eat. He spent 100% of his time trying to escape. I think he tried to push himself through every single opening of the cage he was in at least a million times. He is one very determined little duck. Wood Ducks are perching ducks so they have claws like Muscovies. This means that they are escape artists. Woody can also jump about three feet straight up into the air. I considered putting him in my solid-walled brooder, but I wanted him on wire for cleanliness since I’m wet brooding him. I was lucky to have gamebird starter already on hand, since that’s what I feed my quail. A bit of research seemed to show that that would be best for him, however he didn’t seem the least bit interested in trying it. I finally had an eureka moment when I decided to mix the crumbles with water and place them in a shallow saucer. About ten minutes later, I peeked downstairs to see him happily eating away. That was a joyful moment. 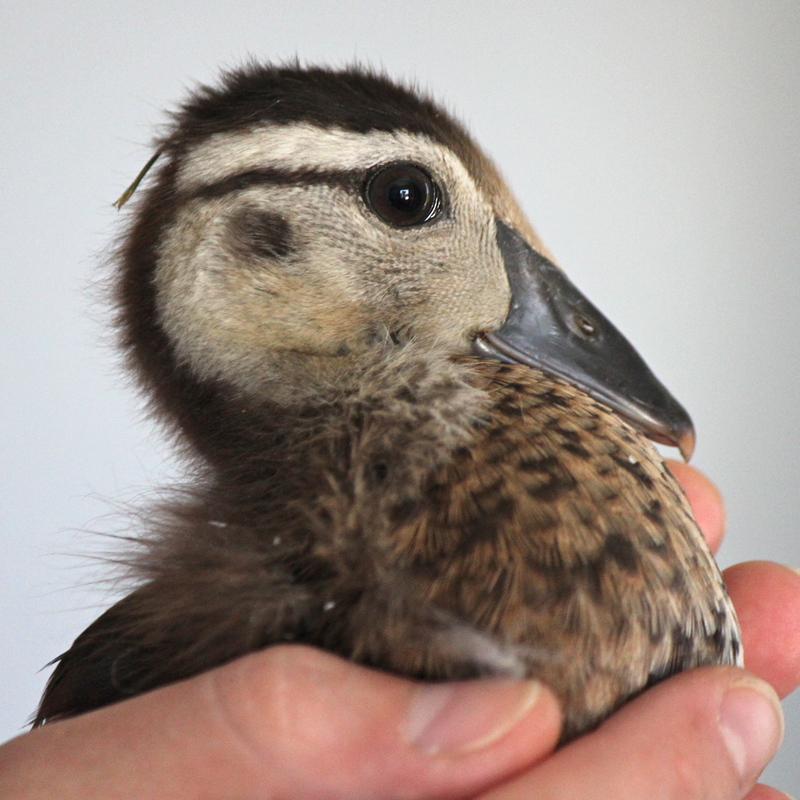 So far he’s been an incredibly feisty little wild duck. He hisses at the cats with his beak gaping and charges at them. He swims in his little pool and preens himself. He basks in the sunshine during the day. He’s become a lot friendlier in just the few days he’s been here. He no longer frantically tries to escape and seems to like it when I come to talk to him. According to what I’ve read, if he’s a boy he will ultimately fly south for the winter and probably not return, but if he’s a female she will return to us every year to raise her young. I’m now conflicted as to whether I’m hoping for a female or a male. The male has heart-stoppingly beautiful plumage, but won’t stay. The female is more drab, but will return. Interesting trade off. This entry was posted in muscovy ducks and tagged Aix Sponsa, Getting Wood Duckling to Eat, Orphaned Wood Duckling, Raising Wood Ducklings, Raising Wood Ducks, Single Wood Duckling. Bookmark the permalink.